A good MPS provider not only optimizes the print fleet, but provides ongoing management to give full visibility and control, and to identify further opportunities for improvement as user needs change, or new technologies become available. This can include going beyond just document output. The way in which documents are printed gives an insight into the underlying workflow, and this can identify additional and even more significant opportunities for improvement – for example by improving automation and the efficiency of work processes and eliminating unnecessary printing. Now you may say, this sounds like something for large and sophisticated organizations, but maybe not for you. It is true that when MPS first started, more than ten years ago, it was adopted mainly by large enterprises. However, the huge expansion in the range and functionality of software tools to manage printers has helped to simplify and automate processes, so that MPS can now be delivered efficiently to medium and small organizations. 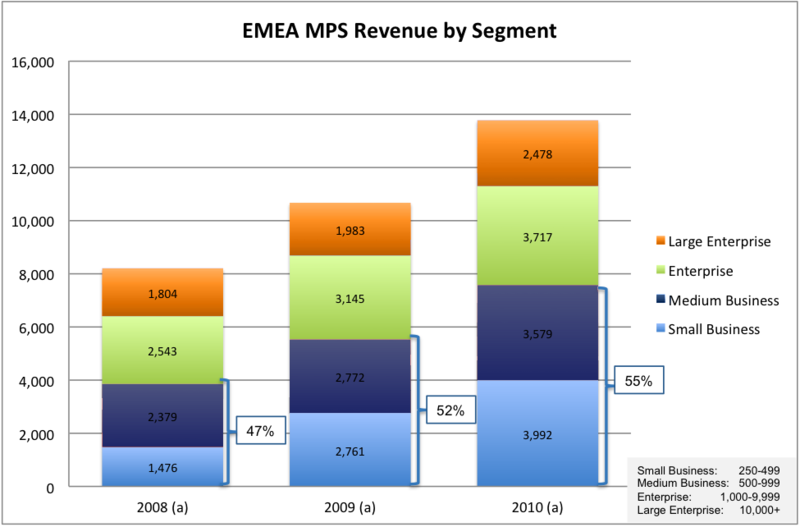 In fact this is where the fastest growth in MPS is now occurring in Europe. Rapid Growth in the SMB Segment. This brings me to my final point, which is who to go to for an MPS offering. The major and well known manufacturers of printers and MFPs all have MPS programmes. However, a lot of recent activity has been around medium and smaller users and is coming from independent MPS providers. They have some significant advantages as their motivations are nearer their clients. They derive their revenue more from the services they provide to users, and are less dependent on sales of hardware and consumables. This means that they can take a more soft touch, independent as well as cost-effective view, for example re-utilising some of the user’s existing equipment rather than feeling the need to replace it with their own hardware. This article was written on 28 Mar 2013, and is filled under Managed Print Systems.